Due to many requests I have finally written down the crochet pattern to my heart bunting, which I designed a while ago now, but still hangs beautifully in my kitchen. Perfect for the summer to decorate your gazebos or beach huts, maybe for a newborn baby room or for a birthday special occasion. A simple project but with great results. If you prefer you can ch4, sl st in 1st ch to form a loop and work the stitches above into the loop. Keeping heart tight and bringing yarn to front ch1, 2sc in next st (1st tr from previous round), 2hdc in next st, 2dc in next st, 2hdc in next st, 1sc in next 3 sts, [1sc, 1dc, 1sc] in the next st, 1sc in next 3 sts, 2hdc in next st, 2dc in next st, 2hdc in next st, 2sc in last st, sl st in ch1 to join, joining W as you sl st. Continuing with W, crochet 1sc in next 2 sts (do not ch1), 2sc in next 5 sts, 1sc in next 5 sts, [1sc, 1dc, 1sc] in the next st, 1sc in next 5 sts, 2sc in next 5 sts, 1sc in last 2 sts, sl st in 1st sc to join. Pull up yarn to create loop, fasten off and placing finger through loop to secure, double knot in place, tie in all tail ends if required. Using the same hook and yarn as hearts, ch20 between hearts, joining hearts as you go. Any questions or for more free patterns join me on my various social media channels. © HappyBerry This pattern can not be reproduced in any way without credit given to HappyBerry. This includes copying and pasting into another blog or website, and filming the pattern for use on YouTube. You can however print it off for personal use or for use in a crochet group. Items made from any of my patterns can be sold in your own stores however. Patterns are not for re-sale. Thank you. 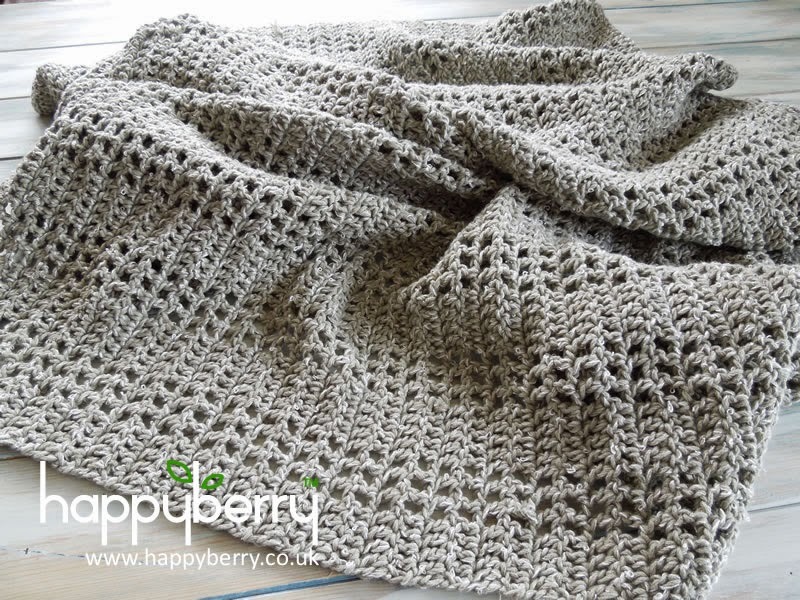 Can you sell items made from crochet patterns? Know the FACTS! Oh, the endless debate to this question "can I sell items made from crochet patterns, without the designers permission?" The short answer is... well there isn't a short answer. Some designers would have you say NO! and some crocheters would have you say YES! What I can say is that the law does fall in favour of the designer, however much people want to ignore this fact, and it certainly isn't about pushy designers having their own way. So here are some FACTS when dealing with copyright law, taken from the International Berne Convention of which the US, the UK and many other countries are a member of. So what is the Berne Convention? The Berne Convention is for the protection of Literary and Artistic Works, and so will apply to crochet patterns/designs and was adopted in 1886 as an international agreement to protect the rights of authors who are nationals of the countries who are members of the convention. You can find the full list of country members here. So what rights are protected? The exclusive right to reproduce the work, (though some provisions are made under national laws which typically allow limited private and educational use without infringement). The last point is an interesting one, because those who argue that their own copyright laws are different, and can do what they like with finished items made from a designer's work, may fall fowl of this moral right. Reproducing work from a design and reproducing it, in what the designer may consider, low quality may have a case that their reputation has been damaged. Everything on the internet is in the 'public domain' and thus free to use. No, this is a common misunderstanding. A work only falls into the public domain when the copyright expires, typically many years after the author's death. While work published on the Internet may be publicly accessible, it is certainly not in the public domain. Having said this, it is still certainly worth placing a copyright notice on your work. A copyright notice reminds others that copyright exists, and may therefore help to deter infringement, which is to the benefit of the crocheter to not face legal action. This is restricted. Any adaptation will be legally regarded as a derived work; so if you simply adapt the work of others, it will still be their work, and they have every right to object if publish such a work when they have not given you permission to do so. They are also entitled to reclaim any money you make from selling their work. So the advice is always to create something unique and original, it can still be inspired by the original work, or seek permission from the rights owner however this may incur a fee or royalties. No. Unless it is explicitly allowed under fair use or fair dealing rules, any unauthorised use of copyright work can potentially lead to legal action. You may be surprised to know that again, no you cannot except in specific circumstances permitted under fair dealing/fair use rules. Any copying or publication without the consent of the copyright owner is an infringement, and you could face legal action and a claim for damages to reclaim lost revenue and royalties. This is not the case, copyright law is principally civil not criminal law. Civil law requires a lower burden of proof, actually making it easier to prove infringement. In a criminal case, the defendant is innocent until proven guilty beyond any reasonable doubt. However, in a civil case, the plaintiff must simply convince the court or tribunal that their claim is valid, and that on balance of probability it is likely that the defendant is guilty. Ultimately it will come down to the individual circumstances between the plaintiff (the designer) and the guilty party, and the final decision of the judge's rule, and even then many copyright infringements are settled out of court, but it is always advisable to err on the side of caution when reproducing a creator's original work without permission in ANY form. Some will still argue that creating an item made from a pattern is different and they can do what they like with it, but you may want to check a designer's terms and conditions before setting up shop, as you will have accepted the designer's terms, thus creating an agreement either by registering on their website or simply by downloading it, and even then you still also may fall fowl, like I said before, of being accused of having the designer's honour or reputation impacted, and all it takes is a good lawyer! I'm fairly easy going even after reciting all this information, (mainly because I'm sick of the ignorance that circulates the internet). All of my patterns are copyrighted (obviously) and may not be reproduced in any form, including written or via video format without prior permission, but items made from any of my patterns, unless otherwise stated, can be sold in your own stores however. This applies to individuals only and not companies however. This information has been taken from the UK Copyright Service. 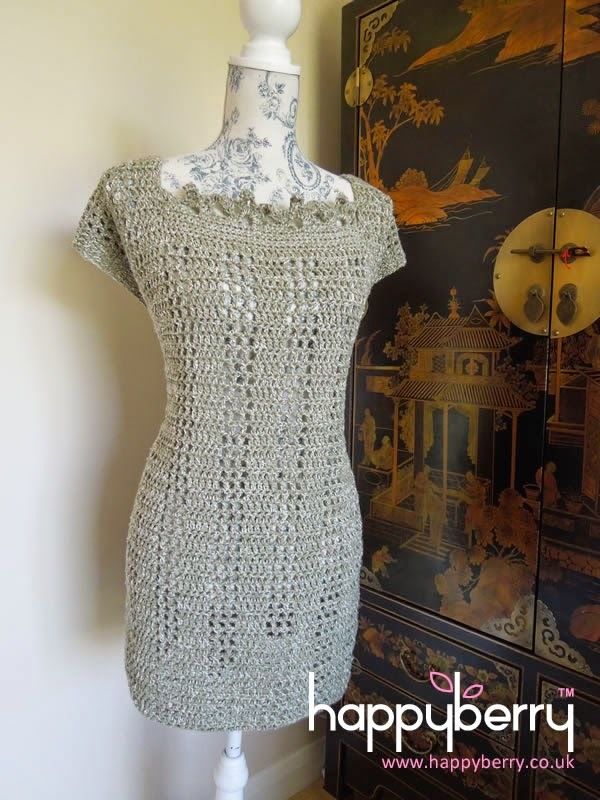 This pattern sadly only comes in one size as I designed it specifically for me, as I really wanted to design a crochet jumper that looked different, and used a thinner yarn than the normal chunky yarn I usually use. However I would still like to share with you the pattern for your enjoyment though. Hopefully it will inspire you to adapt the pattern if you are larger or smaller than the stated size here. 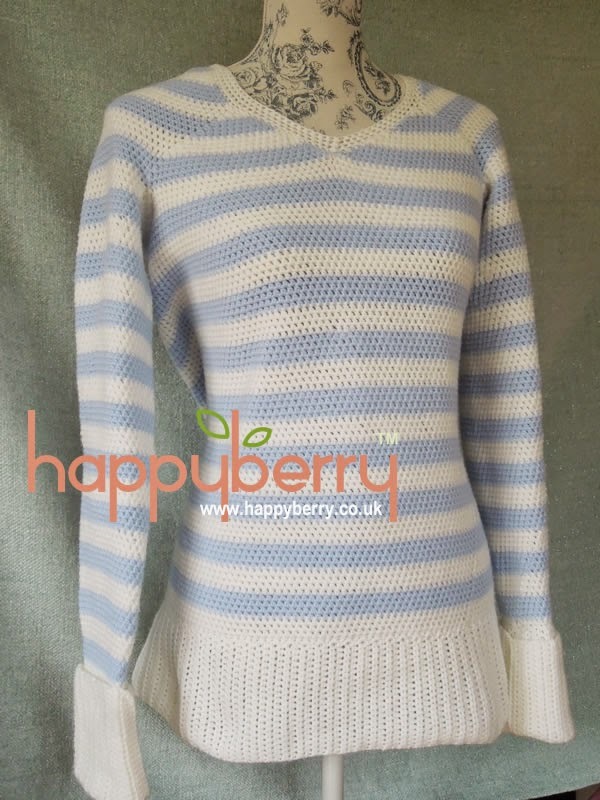 This sweater pattern is a medium to fit a UK size 10-12 (US 8-10). Second Note* Crochet less foundation stitches for a shorter cuff. Fasten off and tie in all tails. Repeat for other sleeve. Join your alternate colours in sl st at end of round as per sleeves. Note* Do not turn on these rounds, but crochet around as normal, fastening off and re-joining your yarn when stated to create the v-neck line. Tip* It sometimes looks like there is an extra st at the end, this is what I call a fake st, be careful not to crochet into it, always check your stitch count. Note* Now work sts as normal, not into spaces. Sew up remaining gaps under arms. 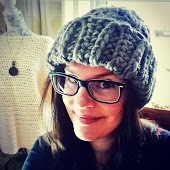 I would like to share my experience on how I picked up crochet as a hobby and how it has helped me after a setback in 2012. My crochet journey started in 2008 when I was in between jobs. It so happened that during my job search, there was a crafting fair at the Red Dot Museum in Singapore. I have always enjoyed doing crafts at a very young age, so I went down to the fair with my sister to see what the stalls were selling. Our intention was just to go and take a look. I came across a stall which sold handmade dolls and my first impression was “Wow!” These are really lovely. My dream then was if only I could make these beautiful dolls, then I would be able to set up my own little shop and sell them to kids who would be interested to own them. I was truly fascinated and intrigued in knowing “how to” learn to make them myself. I took a name card from the lady mending the stall and we communicated via email. She invited me to go for a crafting club meeting and introduced me to her friend who ran the club and also taught people how to crochet and knit. To cut the story short, I ended up taking a basic course on how to crochet from my current teacher now turned friend, Betsy. I still remember the times when I would have to travel one and a half hours to and another one and a half hours back from my Teacher’s place in Sembawang. My lessons then were conducted in Betsy’s small cosy room turned crafting studio for the students whom Betsy recruited. My very first project was a handphone pouch. After mastering the basic stitches in crochet, I went on to make my very first amigurumi, a baby goat which is my current profile picture. Needless to say, I became addicted to making amigurumies because they were so cute and they were good as gifts. I am truly grateful that I managed to pick up crochet as a hobby and even master the skill of making amigurumies because never would I realise that this skill would see me through a difficult setback in 2012 and help me to get back up on my feet. Crochet has indeed helped me come a long way during difficult times. It has enabled me to think of how I could match different yarn colours to beautify my projects and even to add props to beautify my photos. 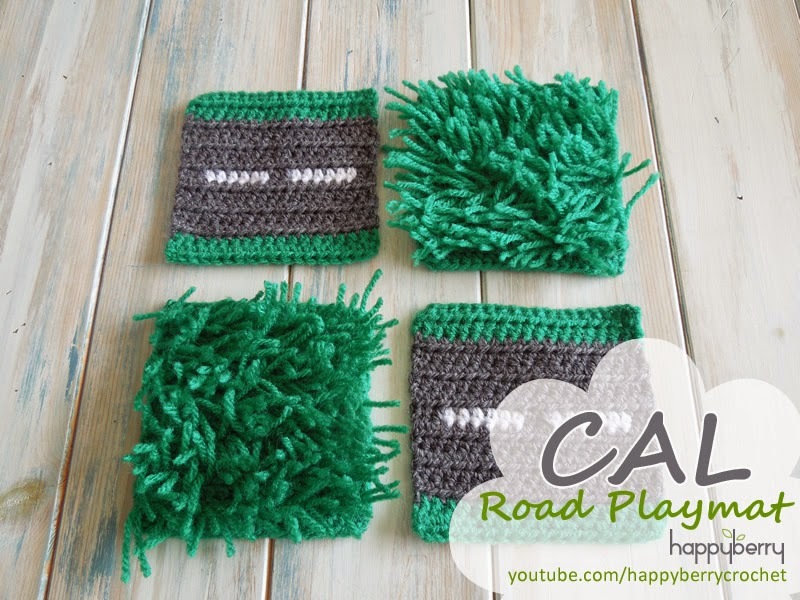 The possibilities of what one can make with just a ball of yarn are truly amazing and endless. My two bunnies in their carrot homes have won me a free pattern from http://Briabby.com a site selling patterns, kids’ hats and clothing for the little ones and last but not least and my entry for “Sofia the Ladybug girl loves ladybugs” came in first in Little Yarn Friends crochet along competition held in 2014. Looking back, I would say that I am proud of what I have managed to achieve in my crochet journey and I have come to the realisation that it wasn’t so much a “job” I was searching for but rather a direction to something which I could be good at and excel in, something which could fill a void and a sense of emptiness which I felt deep within. What prompted me to write this post is that I finally realised that more than realising my dream of opening a shop to sell things is the beauty derived from my own creations that blesses my heart and puts a smile on other people’s faces too. Just like life is a journey, crafting and creating is a journey too and I believe that I would never have come this far without the support and encouragement given to me by some sweet friends and family members. The versatility of crochet stitches just keeps me on the learning journey and I hope to be able to write up with my own patterns someday. I am indeed grateful that I have mastered such a useful skill and I hope that what I have shared would bless someone else’s heart or even encourage someone to pick up the skill. If you would like to appear as a guest blogger then please get in touch to share your story. What does CAL, WIP, Frogging and JAYGO mean in Crochet? If you are new to crocheting, just learning the basic stitches can leave you feeling a little left out of the party, but what about when you come across not just new stitch abbreviations but a new crocheting lingo that you didn't even know existed? And by this I mean all the strange abbreviations such as WIP or CAL, which can be exhausting to Google and find out what they mean so you don't feel so silly asking the crochet community. So here is my quick breakdown of the acronyms I have come across over the years, that even befuddled me once upon a time. WIP is probably the easiest acronym to figure out, especially when it goes along with a certain picture you've seen which says it underneath, and it means 'Work In Progress'. I still have numerous WIPs I know that. The biggest project I have ever 'frogged' was my Petal Trim Tunic, which became my Afghan Baby Throw not so soon after. CAL is an acronym that can elude crocheters for quite a while as it is never exactly clear even when seen alongside a certain project, but it is fairly simple and means 'crochet along' and a 'crochet along' is an event that many designers like to run to engage viewers to join them in making something unique, such as an afghan, and different granny squares will be shared at various times so you can crochet the same time as other crocheters or the designer. So now you know the term, maybe you can enjoy something new! which reminds me, I really must run a CAL at some point. Any suggestions for CAL subjects please feel free to post a comment below with your ideas. JAYGO is an acronym that is often seen again with CALs or other large on-going projects, and it means 'Join As You Go' so can often relate to afghans that require sewing or crocheting together many squares or shapes. As and when I remember more acronyms or expressions I shall add them to this blog post. 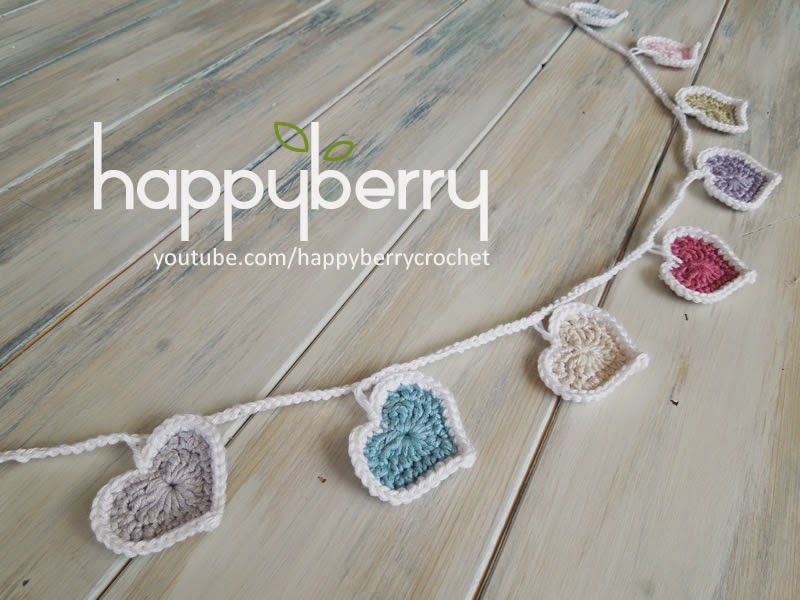 It is soon approaching to be that time of year again when romance fills the air and many crocheters start looking for some fun heart filled crochet projects to try and we have quite a few to try here at HappyBerry. 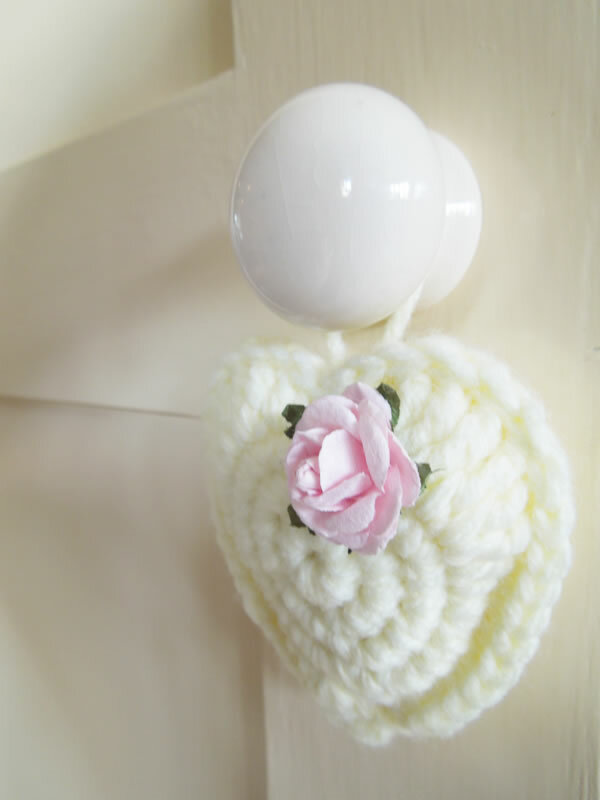 Our heart bunting, crocheted in pastel colours with a white border, give a lovely finish to any room and they don't have to be just for Valentine's Day. Why not crochet them for a summer party or why not use a sparkly yarn for an extra special Christmas treat. 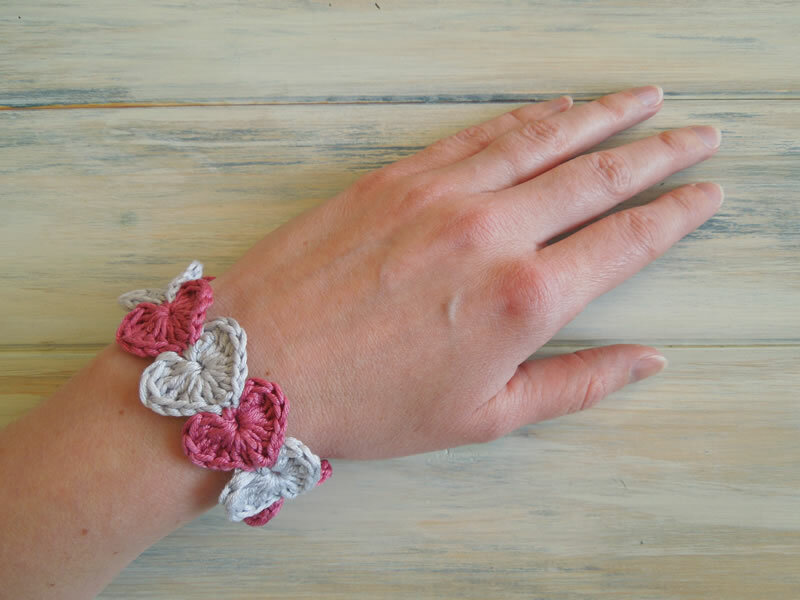 Our quick and simple mini hearts are great fun to try, especially if you like using up scraps of yarn. Why not make some and glue them onto card to make extra special greeting cards, or make lots and use them as romantic confetti on a bed. Our heart bracelet tutorial gives step by step photo guides via the link below. A fun project for teens or adults to try. Why not make one and give to a friend this Valentine's Day. A cool alternative to a friendship bracelet. These hearts were designed in aid of a baby charity, Little Hearts Matter and the pattern comes as a video tutorial. Made in two halves you can either sew them together in a different colour or in the same colour as a complete heart. Perfect as decorations around the house, or as keyrings. An old pattern but a goodie, and perfect to hang around the house as pretty decorations. Why not fill them with lavender and use them in wardrobes or clothing drawers to give a sweet scent to your clothes. I hope you find something fun to try this Valentine's Day. Any questions or for more free patterns join me on my various social media channels.